Having different types of users is one of the most exciting features of WordPress. Depending on your website type, you may need to add multiple authors, editors, or contributors. In some cases, you may need to have several admins as well. Luckily, WordPress comes with a ready-made solution to help you create different types of users. In today’s post, I will introduce you to all the different types of user roles, how to manage the existing users, and how to add new users to your site. Super Admin: The super admin role is only available on the multisite networks. Users with this role will have admin options over all the websites in the network. They can manage other users and configure the settings for all these sites. Administrator: An admin has unlimited access to all the administration and management options on a WordPress site. They can manage the other users and settings options for the website. Editor: Editors can create, publish, and edit posts on a WordPress site. They can manage their own posts and the ones submitted by other roles. Users with this role will not have access to the settings options. Author: Authors can create, edit, and publish their own posts. But they cannot manage posts created by the others or configure the settings options. Contributor: Contributors can submit posts to be reviewed by the editors or the admins. They cannot publish any post on their own. Subscriber: A subscriber can subscribe to your site and edit her profile. She cannot create or manage any post on the site. Now that you know about the available roles and the capabilities for each role, let’s find out how to view a list of all the users on your website. The page displays a list of all the registered users on your website. 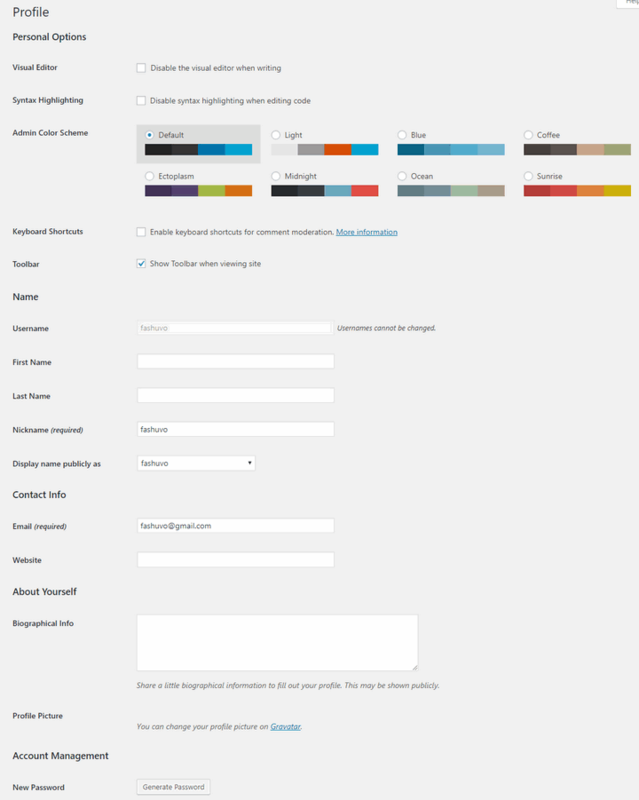 For each user, you will find the username, name, email address, role, and the number of posts they have published. You will find the total number of users along with the number of users in different roles at the top of the page. There is a search user field on the right side of the page. Hovering over each user will reveal additional options to edit, delete, or view the profile. It is also possible to change the user role. To do that, select the user, and choose the new role from the “Change role to…” section located both at the top and bottom of the page. You can change the roles for multiple users be selecting them and choosing the new role. 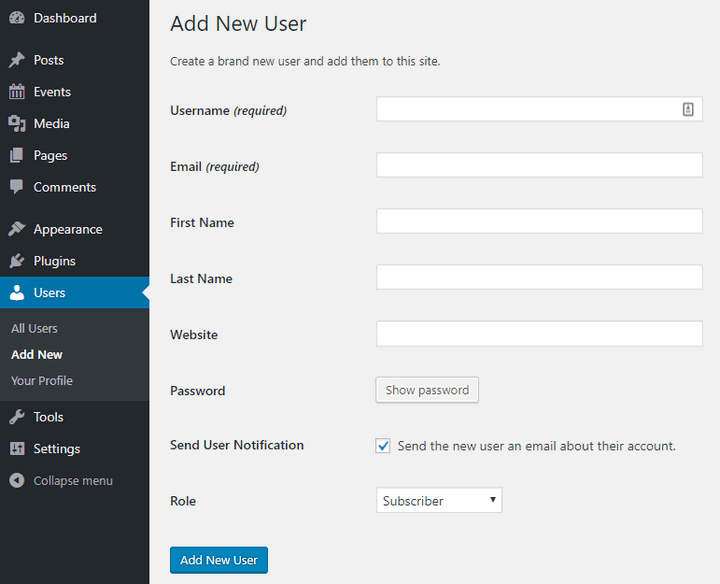 The first two fields enable you to provide the username and email address for the new user. Both of these fields are required to create the user. Next, you will find more fields to provide the first name, last name, website, password, and choose to send the new user a welcome email. Finally, you can choose the user role from the drop-down list. Once you have made the necessary changes, click the “Add New User” button to add the user. It is also possible to allow user registration on your site so that the visitors can register themselves. To do that, go to Settings > General, and enable the “Anyone can register” option. The next option enables you to choose the default role for the new users. These are the roles we discussed at the beginning of this tutorial. Click “Save Changes” to apply the new settings. From now on, new users can register on your site. Now you need to let the visitors know that they can register on the site. The easiest way to do this is to show the meta widget on the sidebar. If you reload your website now, you will find a new sidebar section containing the register and login links. First of all, you will find some options to disable the visual editor when writing, disable syntax highlighting, and choose the color scheme for the profile. Then, in the “Name” section, you can change the first name, last name, nickname, and display name. In “Contact Info,” you can provide the email address and website for this profile. If you want to add a short biography for the profile, you can do that in the “About Yourself” section. Lastly, “Account Management” enables you to create a new password and to log out this account from all other locations. Click the “Update Profile” button to apply the changes and update the profile. Managing a website with multiple users used to be a challenging task. 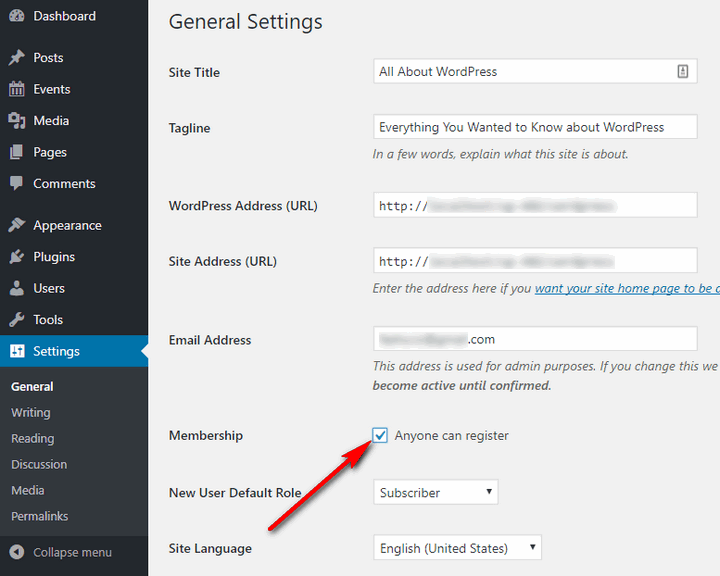 However, WordPress made it very easy by offering built-in user management features with your website. You can use these features to create different types of users depending on your requirement. So, what type of users do you have the most on your website? Let me know in the comments below. And if you have any other user management tips, let me know that too.